They say the devil is in the details, and I guess that’s especially true for the upcoming R-rated reboot of long-running fan-favourite comic Hellboy. The character was originally brought to life on -screen by Ron Perlman in director Guillermo Del Toro’s cult duology, but now he’s being played by Stranger Things star David Harbour. And we finally know what he looks like…. and it’s kind of familiar at first. Hellboy comic book creator Mike Mignola broke the reveal, tweeting out a pic of Harbour in full makeup and costume, captioned with the demonic hero’s catch phrase “Holy crap…”. At first glance, that does look very similar to Perlman’s Hellboy, which is actually to be expected. Del Toro and co already nailed the look back with their films, so it makes sense that new director Neill Marshall (The Descent, Game of Thrones) should hit something similar. After all, you can only depict a shirtless, hulking demon with a giant stone hand, a massive revolver and shorn off horns in so many ways. But if you look closer at the high-res version of that pic above, there are some differences that I really dig. Perlman’s Hellboy had a much more cartoonish red colour to him that made his skin look almost plastic-like, and his stone hand also suffered from this the most. It basically looked like moulded putty. 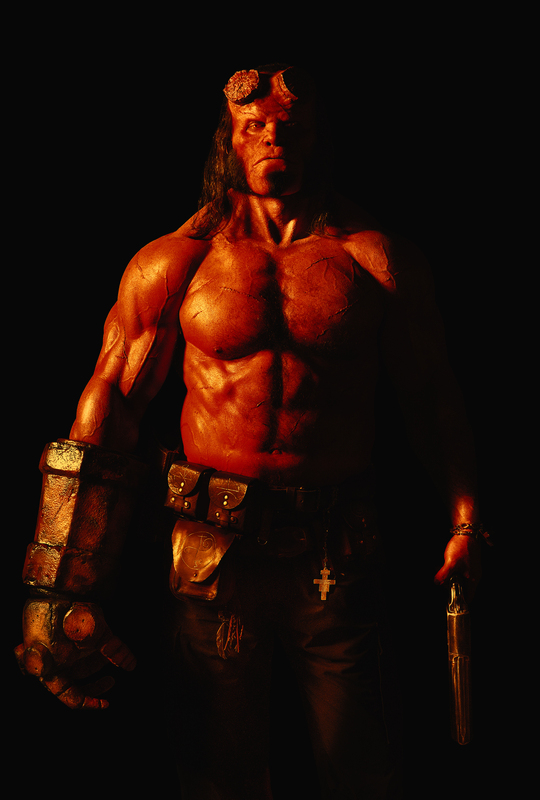 Harbour’s Hellboy on, the other hand (pardon the pun), looks way more real. That looks like real skin, complete with blemishes, scars and veins. His shade of crimson has also been toned down to ditch the cartoonishness. Most notably his Fist of Doom also now has an almost metallic look which is worn and weathered with tons of texture to it. That’s what I see here overall: texture. Oh and far more unruly mutton chops. After Mignola’s official reveal, Harbour himself tweeted another pic in black and white, this time showing Hellboy in his signature trenchcoat. The tweet was captioned “Please allow to introduce myself, I’m a man of wealth and taste…”, referencing the Rolling Stones’ classic rock anthem “Sympathy for the Devil”. Harbour has since deleted the tweet for some reason, but this is the internet and once it’s out there you’re not getting it back. Along with the look at Hellboy, there’s also been some casting news for the film. British actor Ed Skrein (Deadpool, Transporter: Refueled) made headlines around the world a few weeks ago when he revealed that he was exiting the project shortly after being cast in it as Major Ben Daimio, a no-nonsense military man that’s also a member of the Bureau for Paranormal Research and Defense alongside Hellboy in the comics. Skrein revealed that when taking the role, he did not know that Daimio was of half-Japanese half-American descent. Once the character’s Asian ancestry was brought to his attention though, he felt it only right to vacate the role for somebody more culturally appropriate. It is clear that representing this character in a culturally accurate way holds significance for people, and that to neglect this responsibility would continue a worrying tendency to obscure ethnic minority stories and voice in the Arts. I feel it is important to honor and respect that. In a time where there has been a very vocal outcry of whitewash casting in Hollywood, Skrein was praised for taking the initiative and basically forcing Lionsgate’s hand to cast the role properly. They’ve seemingly done so now, as it’s reported that Hawaii Five-O and Lost star Daniel Dae Kim has been tapped to now play Major Daimio. Kim, alongside Hawaii Five-O co-star Grace Park, has recently been embroiled in his own racial controversy, as the two exited CBS’ ratings hit over not receiving equal pay with their non-Asian co-stars. This adds even another layer of fixing things up to his casting here. Kim will be joining a supporting cast that includes Milla Jovovich as the Blood Queen (the film was initially billed as Hellboy: Rise of the Blood Queen), Ian McShane as Hellboy’s adoptive father Prof. Broom, Sasha Lane as the magical Alice Monaghan and Penelope Mitchell as elder witch Ganeida. The film was co-scripted by Mignola himself alongside Andrew Cosby, Christopher Golden, and Aron Coleite. It is scheduled for release on January 11, 2019.